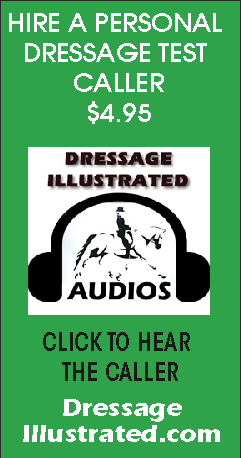 Lexington, KY (August 16, 2018) - The United States Dressage Federation™ (USDF) is pleased to announce that Region 2 Young Rider Callie Jones, of Henderson, KY, and her ten-year-old, Hanoverian gelding, Don Philippo, were awarded this year&apos;s Fiona Baan “Pursuit of Excellence” Memorial Trophy. 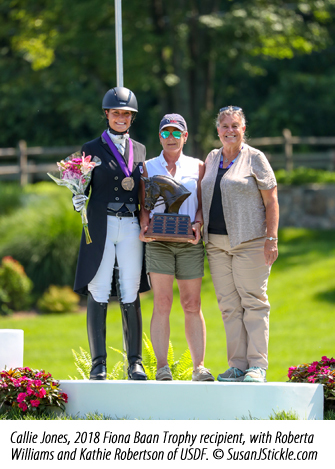 This trophy, which is on permanent display in the Roemer Foundation/USDF Hall of Fame, is awarded to the Young Rider who earns the highest combined average score in the three dressage tests: FEI Young Rider Team, Individual, and Freestyle. Jones placed first in both the team and individual test, and was third in the freestyle test at this year&apos;s USDF North American Youth Dressage Championships, held during the 2018 Adequan®/FEI North American Youth Championships, presented by Gotham North (NAYC). Jones secured the win with an overall combined average of 72.268%, from her scores of 71.824% in the Team Test, 72.206% in the Individual Test, and 72.775% in the Freestyle Test. The “Pursuit of Excellence” is the legacy Fiona Baan left to all FEI Young Riders, and indeed to everyone who ever knew or worked with her. For nearly 30 years, Ms. Baan worked tirelessly with great dedication to the United States Equestrian Team (USET). 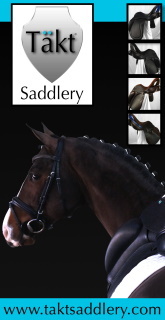 She was U.S. Dressage Team Leader for the 1976 Olympics Bronze Medal team, the 1987 Pan Am Games, and for the bronze medal dressage team at the 1992 Barcelona Olympics. For more information about the USDF North American Youth Dressage Championships, the Fiona Baan “Pursuit of Excellence” Memorial Trophy, or the Roemer Foundation/USDF Hall of Fame, visit the USDF website at www.usdf.org.